This PDF to word converter will preserve all contents, graphs, charts and text layouts, images and layouts, superscript, subscript, drop caps, and underlined text. Even the tables, hyperlinks and graphic objects like Line, Curve and Rectangle could be reserved accurately from PDFs. With this functionality, it will save your time to compose the material after converting PDF to Word. PDF documents are one of the most widely used document formats. They are displayed exactly in the same way over different machines irrespective of the hardware or software configuration of the computer where they are viewed. However in various cases you may need to convert PDF files to MS Word documents for further processing. PDF to Word Converter instantly converts PDF files into Microsoft Word documents that look just like the original - complete with all formatting and images! Information is set free - free to be edited and free to be integrated into your documents. PDF to Word software is a standalone program and does not require Microsoft Word, Adobe Acrobat, or even Acrobat Reader. PDF to Word is a batch PDF Converter that you can convert a lot of PDF files to word documents once time! saving your time! We offer you full-featured PDF-to-Word Converter - a program to convert PDF docs to Word format with a minimum loss of original information. This software allows you to convert PDF files to other editable documents, so, you can modify them any time you wish, cut or copy any part of your original PDF file content and paste it anywhere you need. By converting Adobe to Word documents you not only do your alterations easily, but also save a great deal of time. VeryPDF PDF to Word is a standalone software, MS Word, Adobe Acrobat and Reader NOT required! PDF to Word Converter retains the layout of the original PDF document, creating a fully-formatted and editable Microsoft Word document. PDF Converter separates text, columns and images, giving you amazing access to text and data. Best of all, PDF Converter works with all industry-standard PDF files that were originally created from popular PC applications - including Microsoft Word, Quark and others. 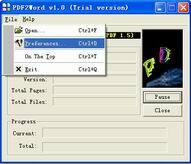 Conversion of PDF to Word format can be also very easy with just a few mouse clicks required. With our full-featured converter of PDF to Word files you can turn PDF to Word files keeping all the information contained in the original document. You can then edit and copy it without any hassles and limitations.